Elizabeth Lamorna Kerr - The Bridge of Wool, River Camel, Wadebridge, Cornwall - Online gallery supplying original fine art. Trending Modern British and Contemporary Welsh. Available for sale from Big Sky Fine Art; this original oil painting by Elizabeth Lamorna Birch dates from the post war period.<br> The work is presented and supplied in a sympathetic contemporary frame.<br> <br> Elizabeth Kerr was a painter, driftwood sculptor and teacher. She was the eldest daughter of the painter Samuel John Lamorna Birch and he taught her to paint. Her mother was the artist Emily Houghton Birch. Elizabeth often sat as a model for her father and other artists of the Newlyn colony and therefore appears in the works on Laura and Harold Knight, Thomas Cooper Gotch, and Augustus John. <br> <br> She was born and died at Flagstaff Cottage, Lamorna Cove, Cornwall. She was a lively athletic child and fond of swimming. She was educated at Badminton School in Bristol, also taking some lessons at the Bristol School of Art. After leaving school she went to London with the intention of becoming a ballet dancer but instead trained as milliner. She married the author James Lennox Kerr, who also wrote under the names Peter Dawlish and Gavin Douglas. They moved to Scotland, where she took further art lessons in Paisley, Renfrewshire.<br> <br> Her heart however always seemed to be in Lamorna and she and her husband returned there in 1939. Throughout the 1920s and 30 Elizabeth and her sister Joan, along with their mother, had showed various handicrafts at the Newlyn Art Gallery. Both demonstrated considerable talent in watercolour and oils. Elizabeth specialised in flower painting, and featured her beloved Lamorna regularly in her work.<br> <br> Following her mother’s death in 1944 Elizabeth and her husband ran the family home of Flagstaff on the cliffs above Lamorna Cove and looked after her father there until his death in 1955. <br> <br> Elizabeth was known as “Mornie” and was a friend to many of her father’s circle, including a lifelong friendship with Laura Knight. She promoted her father’s work passionately, as well as exhibiting her own paintings at the Royal Academy eleven times between 1939 and 1951. Her work is described as “more Post Impressionist than Impressionist” Her still life studies are notable for their handling of light. She also exhibited regularly in mixed shows at Newlyn. She was Chairman of Council there during 1953 to 19555 and Hon President following her father’s death that same year. <br> <br> After her husband died in1963, Elizabeth devoted more time to painting and set up a teaching and painting circle which continued under her supervision until her death at Lamorna in 1990 at the age of 85. Her obituary appeared in the Daily Telegraph on 3rd April 1990. She was remembered as a positive, encouraging teacher and forceful, down-to-earth personality. <br> <br> Her work was exhibited at Penlee in 2002. A biographical memoir, In Time & Place, Lamorna, was published in 1994 by her friend and pupil, Melissa Hardie, and is based upon her long life among the artists of the West Cornwall area.<br> <br> Her son Adam Kerr and his artist wife Judith Kerr, keep the artistic<br> traditions of Flagstaff Cottage, Lamorna alive for the area, with Adam serving as President of the Lamorna Society of Artists who work and exhibit together in the Valley. 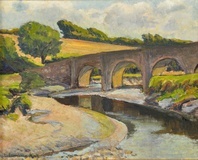 Many of “Mornie's” former pupils are working today.<br> <br> This original oil painting is a stylised piece depicting the stone bridge at Wool, Wadebridge, Cornwall, which crosses the River Camel. The painting shows three of the stone arches of the bridge, the latter of which spans the curve of the river. The raised banks of the river look wet, consistent with the water level having fallen away to low tide. Within the coming hours, we expect the flood tide to swell the river up its banks again. Beyond the river banks are fields with meadow grass and a ripening crop. There is abundant hedgerow and a rounded tree, the whole impression being fertile and expansive. The sky is pale blue with high white clouds, and the colour of the fields suggests that this is certainly summer. Available for sale from Big Sky Fine Art; this original oil painting by Elizabeth Lamorna Birch dates from the post war period. The work is presented and supplied in a sympathetic contemporary frame. Elizabeth Kerr was a painter, driftwood sculptor and teacher. She was the eldest daughter of the painter Samuel John Lamorna Birch and he taught her to paint. Her mother was the artist Emily Houghton Birch. Elizabeth often sat as a model for her father and other artists of the Newlyn colony and therefore appears in the works on Laura and Harold Knight, Thomas Cooper Gotch, and Augustus John. She was born and died at Flagstaff Cottage, Lamorna Cove, Cornwall. She was a lively athletic child and fond of swimming. She was educated at Badminton School in Bristol, also taking some lessons at the Bristol School of Art. After leaving school she went to London with the intention of becoming a ballet dancer but instead trained as milliner. She married the author James Lennox Kerr, who also wrote under the names Peter Dawlish and Gavin Douglas. They moved to Scotland, where she took further art lessons in Paisley, Renfrewshire. Her heart however always seemed to be in Lamorna and she and her husband returned there in 1939. Throughout the 1920s and 30 Elizabeth and her sister Joan, along with their mother, had showed various handicrafts at the Newlyn Art Gallery. Both demonstrated considerable talent in watercolour and oils. Elizabeth specialised in flower painting, and featured her beloved Lamorna regularly in her work. Following her mother’s death in 1944 Elizabeth and her husband ran the family home of Flagstaff on the cliffs above Lamorna Cove and looked after her father there until his death in 1955. Elizabeth was known as “Mornie” and was a friend to many of her father’s circle, including a lifelong friendship with Laura Knight. She promoted her father’s work passionately, as well as exhibiting her own paintings at the Royal Academy eleven times between 1939 and 1951. Her work is described as “more Post Impressionist than Impressionist” Her still life studies are notable for their handling of light. She also exhibited regularly in mixed shows at Newlyn. She was Chairman of Council there during 1953 to 19555 and Hon President following her father’s death that same year. After her husband died in1963, Elizabeth devoted more time to painting and set up a teaching and painting circle which continued under her supervision until her death at Lamorna in 1990 at the age of 85. Her obituary appeared in the Daily Telegraph on 3rd April 1990. She was remembered as a positive, encouraging teacher and forceful, down-to-earth personality. Her work was exhibited at Penlee in 2002. A biographical memoir, In Time & Place, Lamorna, was published in 1994 by her friend and pupil, Melissa Hardie, and is based upon her long life among the artists of the West Cornwall area. traditions of Flagstaff Cottage, Lamorna alive for the area, with Adam serving as President of the Lamorna Society of Artists who work and exhibit together in the Valley. Many of “Mornie's” former pupils are working today. 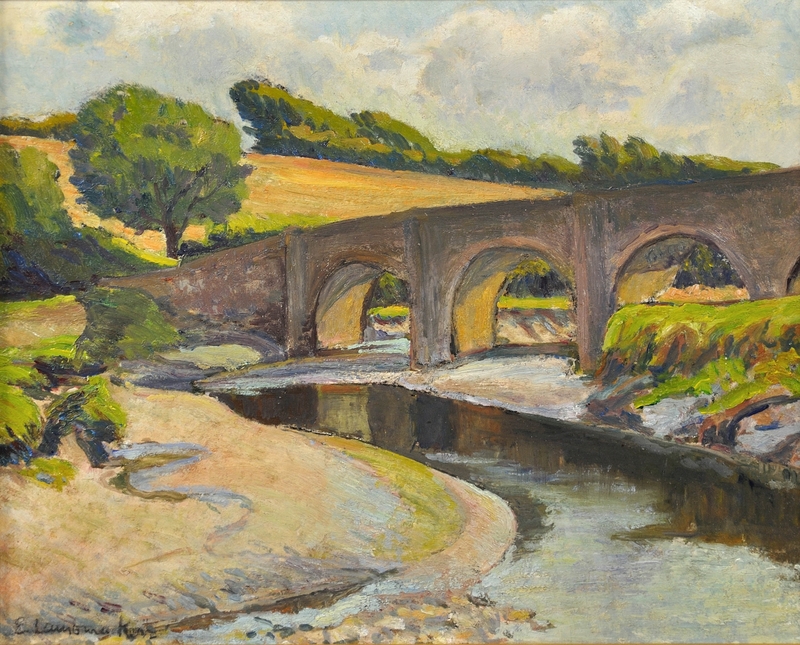 This original oil painting is a stylised piece depicting the stone bridge at Wool, Wadebridge, Cornwall, which crosses the River Camel. The painting shows three of the stone arches of the bridge, the latter of which spans the curve of the river. The raised banks of the river look wet, consistent with the water level having fallen away to low tide. Within the coming hours, we expect the flood tide to swell the river up its banks again. Beyond the river banks are fields with meadow grass and a ripening crop. There is abundant hedgerow and a rounded tree, the whole impression being fertile and expansive. The sky is pale blue with high white clouds, and the colour of the fields suggests that this is certainly summer.